This RGBW Controller is designed for controlling any 12V or 24V RGBW 5-Wire product. Features include colour changing modes (with speed control), white mode, brightness control and a full colour wheel to set any colour you want. Supplied with an RF remote operating at 2.4GHz, with a range of over 30m, this unit will work in the most demanding applications. The maximum output of this controller is 576W (6A per channel). Features include static colour modes, colour-changing/fading modes, speed adjustment, and brightness adjustment. Note that the controller does not cycle through to the first mode after mode 15, you must press the "mode-" key repeatedly to go back to mode 1. The remote takes 2x AAA batteries (not supplied). 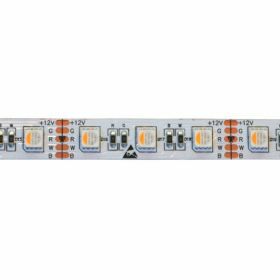 Use this controller with our RGBW strip light.